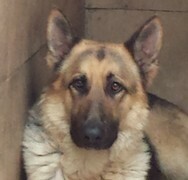 Rescuing a German Shepherd is very rewarding from both rehoming a shepherd for all the right reasons to lowering the unwanted dogs which are being picked up as strays and placed into commercial dog pounds throughout the UK, at the awful risk of being put to sleep within 7 days. With the ever increasing numbers of dogs being placed into dog pounds or being given up to be rehomed now at an all time high, mainly due to the financial circumstances and the dire problems of neglect, we offer to rehome all German Shepherds throughout the UK. Dogs in the UK are suffering at the hands of their owners and the dog pounds are full to bursting along with unsuitable conditions. The German Shepherd Dog is a strong, agile, well-muscled dog, alert and full of life. They are extremely intelligent and make a wonderful companion, show or obedience dog. The German Shepherd is exceptionally trainable and works well as a police, guide, or search and rescue dog. German Shepherds are one breed that becomes truly bonded to their family and may suffer from separation anxiety when apart from their people. They are lively, intelligent and very strong. They are excellent in agility and obedience tests. They excel in serving their masters, and they are continually responsive. Well-mannered German Shepherds should be calm, consistent in attitude, obedient and alert. Some lines of of the Alsatian have become nervous and aggressive due to poor breeding tactics and the popularity of the breed. Overall and generally though, the German Shepherd is an ideal breed. They are large and alert enough to protect, and are loving and friendly towards friends and family. Knowledgeable training and handling are required, however, due to the German Shepherd's natural instinct to protect their owners. Alsatians are large, powerful dogs that are lean enough to have great agility. They have a handsome look, with prick ears and an evenly dispersed weight. They have perpendicular hocks when they stand, rather than angled, which makes them look as if they are posing for a photo. Some have long hair and some have short, and either can be black, gray, tan, gold or white, although whites and golds are not accepted by some associations. German Shepherds make an ideal pet--fun, friendly, and desiring to serve. Temperament: German Shepherd Dogs are intelligent, responsive, and with solid temperament. They should have consistent behavior, be calm and without aggression. They are friendly towards family, and a little reserved with strangers, although they do warm up to them quickly once they perceive to be friendly. They are protective and good guard dogs as well as watch dogs. They are alert, full of life and can be playful. They have proven their trainability in an innumerable amount of ways. They are reliable, good with children, and are said to have the intelligence of a 7 year old child! Good With Children: Yes, loves their owner's children, but may be suspicious of other children. God With Pets: Yes, if trained as a puppy to accept other pets. Special Skills: Search and rescue dog, guide for the blind, sentry dog, police dog, scent dog and of course, family pet. Good Watch-dog: German Shepherds are very aware of their surroundings, and may occasionally even perceive a threat where it looks like there is, but may be none. Guard-dog: They are extremely protective of their family and will stand up to an adversary, but will remain friendly to non-threatening people if trained and bred correctly. Learning Rate: Very High. They are said to possess the intelligence of a 7 year old child! Obedience - High. Problem Solving - High. Training is not easy, as they are intelligent and will try to think of ways to avoid doing what you are asking. Activity: High. Inside and outside. OUR LOCATIONS: We are based in Nottinghamshire and we rehome nationwide in the UK - we have co-ordinators in the North West, Yorkshire, South Wales and here in Notts too. We use kennels in Yorkshire and South Wales, fosterers nationwide and also sometimes the dogs are still with the owners. 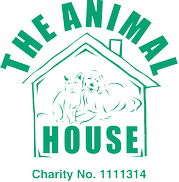 We are a small Birmingham based rescue, which takes in unwanted, abused and abandoned animals. All the animals that come into our care are treated for fleas, ticks, mites and worms, they also have a full veterinary 'm.o.t', and are neutered, if over 6 months, and innoculated before going to their new homes. We do not use kennels, instead we have foster homes, which enable us to see the animals behaviour in a home environment. Any problems can be dealt with and we can re-home them to the most appropriate place. All prospective adopters are home-checked. If you live outside the Birmingham area and would like to adopt a dog, we need a veterinary reference and copies of two recent household bills. Please check with any rental agreements or Landlords to make sure that pets are allowed in your home. All dogs are kept at foster homes and the adverts will show the contact name and number for that home. Please contact them in the first instance as they will be able to advise you better. We also run a feral cat-neutering program, where feral cats are trapped and the females are spayed and the males are castrated. The cats are then released back to where they came from, as hardly any feral cats become tame. Those that do are re-homed. This helps to cut down on the number of untamed kittens born each year. 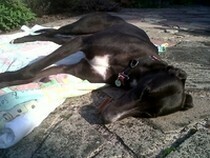 On July 1st 2006 Perry Barr RGT moved our retired dogs to Daybreaks Kennels in Solihull. 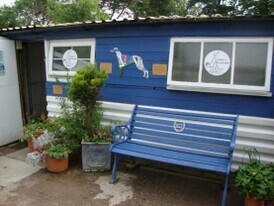 The picture to the right shows our bright and friendly kennels. Welcome to our website. 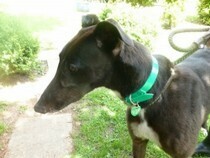 Below is a guide to homing a greyhound from Perry Barr Trust. (1) Contact Ruth (0121 782 7702) and arrange a time to come to the kennels and view the dogs that are available for homing. (2) When you have chosen a dog we will take your details and one of our volunteers will call you within a couple of days to arrange a suitable time to do a home visit. 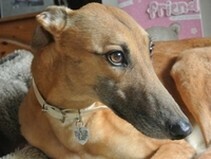 The home visit is a chance for you to ask any questions you may have about homing a greyhound. At the home visit you will be asked to answer a questionnaire about you and your home to ensure the dog will be going into a home where all the required Retired Greyhound Trust criteria are met. (3) If you have satisfied the requirements all the relevant paperwork can be filled in and you can take your new companion home with you. All greyhounds homed by Perry Barr Trust come with four weeks' free pet insurance from Pet Plan, a collar, lead, muzzle and bowl, are microchipped and are fully vaccinated, wormed, flea treated and neutered. We also have greyhound coats, bowls and other items available for sale - all profit goes directly back to the Trust. We do ask for a £25 reservation fee when a dog is chosen and we can unfortunately only reserve a dog for a maximum of 2 weeks. The reservation fee is not refundable or transferable. We ask for a donation of £150 to adopt a grey, so if you have paid £25 to reserve, the balance of £125 is due on the day of adoption. Dog Friendly Wales is proud to be a supporter of the RSPCA Llys Nini and the amazing work they accomplish at the centre. Please take a moment to visit their site and donate anything you might be able to, or if you are looking to get yourself a new best friend and are able to do so please consider adoption, it is very rewarding. 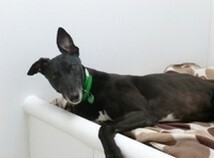 To see all of their current dogs that are looking for new homes, please click here.